Virgin, died in 512. January 3rd Celebration. Contemporary Clovis and St. Remi, Genevieve was born in Nanterre 422. 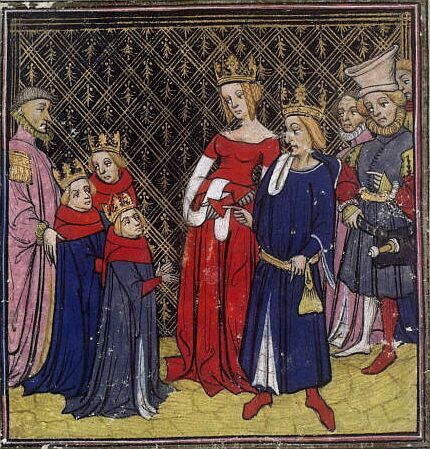 At the age of seven, she met Germain, bishop of Auxerre, and Wolf, bishop of Troyes, who would stop in this town before embarking for England to fight on the orders of the Pope, the heresy of Pelagius. The girl was praying in the church of Nanterre and Germain prophesies to Genevieve’s parents an exceptional destiny of the child. When her mother was struck with blindness for giving a blow to Genevieve, it heals with the water she blessed. Geneviève promised to Germain to devote herself to Christ, and, at fifteen, she received the veil of virgins. At the time, in fact, there were no monasteries of women and those who wished to devote herself to the Lord continued to live in the world, simply distinguished by the veil of their consecration. On the death of his parents, Genevieve came to live in Paris with her godmother. She lives in silence, prayer and mortification, eating only twice a week. It is also favored by extraordinary graces, reading in consciousness and healing the body in the name of Christ through anointed with oil. Saint Germain defends against slanders. Geneviève built the first basilica of Saint-Denis. Night she visited the site with her companions, when the wind extinguishes the candle that lit the way of the small group. Genevieve takes the candle, which comes back right away, and flame resistant to all storms. In 451, Attila crossed the Rhine and invaded Gaul. Parisians get scared and want to flee. Genevieve convinces them to stay in the city. It brings together the women of Paris in the church baptistery near Notre Dame and asked them to beg Heaven to save their city. This is what happens. Abandoning the road to Paris, the Huns are moving towards that besiege Orleans. Constrained by the armies of the Roman general Aetius, they retreated to the north and are decisively defeated the Champs Catalauniques. Later, when the Franks besieged Paris, Geneviève save the city this time of famine. She organizes an expedition through ingenious boats, by the Seine, fetch supplies until Champagne. Her reputation extends to East. Clovis and Clotilde will dedicate her with great reverence. She will be buried with the king in the Church of the Holy Apostles St. Clotilde had built and which will in the seventh century the name of Sainte-Geneviève. Clovis and Clothilde, 5th century. Genevieve died in 512 in nearly 90 years. His body was transported 845 Marizy for fear of the Normans and brought to Paris in 890. From the twelfth century, the reliquary containing the relics are carried in procession through Paris. Miracles take place in its path especially when “ergotism” or “sacred fire” a terrible pestilential fever descended on Paris and all over France, with no medicine could not stop it. It was an internal inflammation, accompanied by gangrene attacking end members. To ward off the plague, the Bishop of Paris, ordered fasts and prayers, and then asked to carry the sick on the way he led the solemn procession to the Basilica Sainte-Geneviève at Notre Dame, November 26. Patients who touched the relic of St. Genevieve were immediately healed, and among the Parisians, only three died skeptical. Evil began to decline and eventually disappear. The following year, Pope Innocent II, in memory of this miracle, instituted the feast of St. Genevieve of Ardent. The reliquary containing the remains of the Holy located in a crypt of the church of Saint Genevieve had a large amount of gold and silver and precious stones which had been given by the nobles. It will unfortunately fade avidly in 1793 by the Paris Commune, and some of her relics were burned by the barbarians before being thrown into the Seine in 1793. The Church of St. Geneviève, confiscated in 1791 with the abbey which it depended, was demolished in 1801 to 1807 … It is unfortunately not the only example of desecration of Christian symbols in the Revolution! Geneviève’s tomb is empty and has been transported to the church of Saint-Étienne-du-Mont, where she continues to be revered. -three reliquaries containing the last relics of the Saint, which had been distributed to other parishes, are deposited at the foot of the statue. Tomb of St. Geneviève of the Saint-Etienne-du-Mont church, Paris. Like the prophets of Israel, as the prophets of ancient Gauls and Germans, she came out of retirement day perils to meet the hearts of his countrymen and predict the future. She had repeatedly announced the invasion of Gaul by the barbarians, infuriating his fellow by his prophetic words. She also predicts that Attila would not come against Paris, and, indeed, Paris had not seen the Huns. Subsequently, she urged Paris to bear the sufferings and terrors of the siege. One day, she embarked on the Seine to fetch at Melun, a large convoy of food she brought in the famished city. Thus, it preserved Paris. 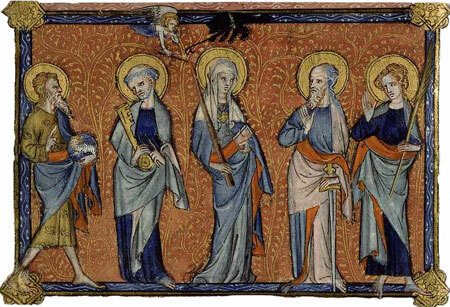 Until the sixteenth century, Genevieve is wearing a dress girl noble, rarely religious she is holding a candle a demon tries to turn, but an angel is lit (Beautiful Hours Duke of Berry, 1407-1408, New York, Cloisters). In another scene, she makes for her mother. A radical change occurs at the end of the fifteenth century: Geneviève becomes a young shepherdess surrounded by sheep was probably there be confused with Jeanne d’Arc child. This transformation can also be likened to the Virgin shepherdess, feminine replica of the Good Shepherd, who does not seem to appear before the seventeenth century. She sits a crook in hand, surrounded by her flock in the midst of a “cromlech” (School of Fontainebleau, Saint-Merry church in Paris). Hugo Van der Goes the watch with a devil off his candle (fifteenth century Vienna, Gemäldegalerie). In the nineteenth century, Puvis de Chavannes dedicated cycle Children of Genevieve (1874, Pantheon, ancient church Sainte-Geneviève in Paris). This entry was posted in ART, FRENCH HISTORY, Paris, FRANCE on December 1, 2012 by webmaster.